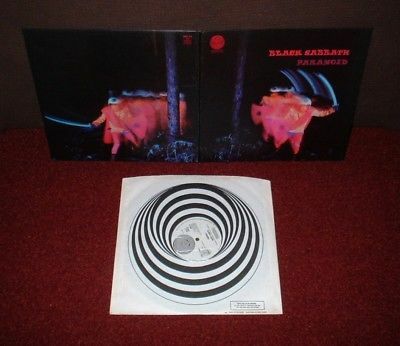 BLACK SABBATH Paranoid LP 1970 VERTIGO 1st Press! MINT!! BIG BEAR CREDIT!!!! FIRSTLY, THIS LP HAS A 'LARGE' SPIRAL VERTIGO LOGO ON THE RECORD LABELS WITH THE WORD 'VERTIGO'PRINTED AT THE BOTTOM OF EACH LABEL(WHEREAS ALL LATER PRESSINGS HAVE A 'SMALLER' SPIRAL VERTIGO LOGO AND THE WORD VERTIGO PRINTED ABOVE THE CENTRE HOLE)!!!! SECONDLY THIS LP HAS 1/1 MATRIX ENDINGS TO BOTH SIDES OF THE RECORD(LATER PRESSINGS DONT!) AND IS 1ST PRESSED ON MASSIVELY THICK VINYL (LATER ONES ARE THINNER)!!!! THIRDLY THIS LP HAS COMPLETELY DIFFERENTGROOVE SPACING ONSIDE B (THE WHITE LABEL SIDE)!!!! ON THAT SIDE THERE IS ONLY TWOGAPS BETWEEN THE TRACKSON THAT SIDE (LATER ONES HAVE THREE GAPS!)!!!! AND LASTLY THIS LP HAS THE 'EARLIEST' 1ST PRESS COVER EVER MADE - WITH AN EXTRA 'CREDIT' ON THIS INSIDE OF THE GATEFOLD!!!! IF YOU TAKE A LOOK AT MY PICTURES YOU CAN CLEARLY SEE IT HAS PRINTED 'MANAGEMENT, JIM SIMPSON, BIG BEAR, BIRMINGHAM' ON THE INSIDE OF THE COVER!!!! THIS ULTRA RARE TEXT ONLY APPEARED ON THE FIRST BATCH OF COVERS EVER MADE (NO MORE THAN A FEW HUNDRED AT AT THE VERY MOST!) - BEFORE IT WAS REMOVED, AND ALL LATER PRESSINGS DONT HAVE IT!!!! THIS WAS DUE TO BLACK SABBATH FALLING OUT WITH THEIR MANAGER (JIM SIMPSON) - AND THIS WAS WHY THIS CREDIT WAS REMOVED!!!! AND PLEASE NOTE - ONLY A FEW HUNDRED OF THE 'EARLIEST' 1ST PRESS COVERS ONLY - EVER HAD THIS ULTRA RARE 'JIM SIMPSON' CREDIT - MAKING IT ONE OF THE RAREST BLACK SABBATH LPs OF ALL TIME!!!! SO THERE IS ABSOLUTELY NO DOUBT AT ALL - THAT THIS IS THE 'EARLIEST' & RAREST 1ST PRESSING OF THIS INCREDIBLE LP THAT YOU CAN POSSIBLY GET!!!! BUT NOT ONLY THAT BUT THIS LP IS IN ABSOLUTELY SUPERB CONDITION - AND CLEARLY HASNT BEEN PLAYED MUCH AT ALL!!!! JUST TAKE A LOOK AT THE PICTURES!!!! THIS IS THEORIGINAL1970UK 'EARLIEST' 1ST PRESSING ON THE 'EARLIEST' 1ST PRESS 'LARGE'VERTIGO 'SPIRAL' LABEL, 'EARLIEST' 1ST PRESS 2 TRACK GAPS ON THE B SIDE, 'EARLIEST' 1ST PRESS 1/1 MATRIX ENDINGS, 'EARLIEST' 1ST PRESS VERTIGO INNER SLEEVE, AND 'EARLIEST' 1ST PRESS GATEFOLD COVER (WITH ULTRA RARE 'JIM SIMPSON' CREDIT!)!!!! THIS LP IS SERIOUSLY RARE AND VIRTUALLY IMPOSSIBLE TO FIND LIKE THIS - SO DONT MISS OUT ON THIS AMAZING OPPORTUNITY!!!! This isthe ORIGINALUK 'Earliest' 1stPressing from 1970 and is in SUPERB condition!!!! The record is pressed on THICK quality vinyl. The Cat. No is 6360 011on the ORIGINAL 1st Press 'Large' Vertigo 'Spiral'Label (see picture) and is a UK 1970Stereo 1st pressing (there were NO Monos)!!!! The record labels are in SUPERB condition (see pictures) with NO writing, NO wear, and only a few VERY light spindle marks!!!! IT IS VERY CLEAR THAT THIS RECORD HASN'T BEEN PLAYED MUCH AT ALL!!!! The vinyl is in AWESOME condition!!!! Most of these 60s/70s LPs had been to a lot of wild parties and are usually found totally worn out, and almost unplayable. This one is NOT and has NO scratches, NO hairlines, NO scufflines, only 2 or 3 absolutely ULTRA light TINY surface traces, and only aVERY few of the lightest paper scuffs only visible under light!!!! ITS AS SIMPLE AS THAT!!!! THE RECORD STILL RETAINS ITS ORIGINAL'JUST PRESSED' LOOK AND LOOKS AMAZING!!!! It is also great to find that the record plays as STUNNINGLY as the visual with NO pops, NO sticking,NO jumps, barely ANY crackle AT ALL, and only some EXTREMELY low level background sound on the run on grooves & gaps - NOT in the music AT ALL!!!! The sound quality is simply SUPERB with NO distortion and NO groovewear either!!!! The record must grade MINT(Minus)!!!! AWESOME RECORD!!!! Believe me this record is NOT overgraded in ANY way!!!! I use STRICT RC grading standards - it is not in my interest not to!!!! Brillant!!!! The record also comes in its ORIGINAL 1st Press Vertigo inner sleeve which is in BRILLIANT condition and still FULLY 'poly lined'!!!! For accuracies sake - although this Vertigo is clearly a 1st Press inner and 100% Geniune, it has NO date code, with only 3 numbers '320' - which I presume means February or March 1970. The ULTRA RARE'Earliest' 1st Press GatefoldCover (with extra 'Jim Simpson' credit!) is in absolutely BRILLIANT condition - and is EASILY the VERY best 'Earliest' 1st Press cover I have EVER seen!!!! It has NO rips, NO tears, NO sticker marks, NO edge wear (apart from some almost INVISIBLE 'touching in' traces to the bottom edges! ), NO spinal wear (side words PERFECT! ), NO spine splits, NO edge splits, only VERY slight corner wear (NOT through the colour! ), NO sticker tears, NO ringwear AT ALL (most do! ), only a VERY few light creases (cover is VERY flat looking indeed! ), barely ANY rubbing AT ALL (virtually ZERO! ), NO annotations, and NO writing!!!! The opening edge is beautifully straight with barely ANY feathering AT ALL!!!! Even the inside of the cover is in SUPERB condition withNO sticker tears, NO grubbyness (apart from 2 absolutely TINY grubby traces! ), NO sticker marks, NO yellowing, NO rubbing, and NO writing!!!! The cover must grade Very Good++++ if not better!!!! BRILLIANT COVER!!!! THIS LP IS SERIOUSLY RARE AND VIRTUALLY IMPOSSIBLE TO FIND LIKE THIS (ESPECIALLY AS THE 'EARLIEST' 1ST PRESSING EVER MADE - IN SUPERB CONDITION FOR ONCE!) - SO DONT MISS OUT ON THIS INCREDIBLE OPPORTUNITY!!!! HAVE A LOOK AT MY PICTURES - I DO MY BEST TO SHOW THE RECORD FROM ALL ANGLES AND MAKE THE PICTURES AS CLEAR AS POSSIBLE - THERE IS NOTHING TO HIDE!!!! It really is a GREAT looking LP and it is truly rare to find any copies of this MEGA RARE LP!!!! THIS WILL BE YOUR ONLY CHANCE TO BUY AN ORIGINAL 1970 UK'EARLIEST' 1STPRESSING OF "PARANOID" BY BLACK SABBATH, IN SUPERB CONDITION!!!! Dontforgetto take a look at allmy other items including many other TOP LPs and contact me with any queries you may have. Postal discounts for multiple buys are always available - and I guarantee to ALWAYS undercharge on postage! Paypal, Bank Transfers, Cheques, International Money Orders, and Postal Orders accepted. Thanks for looking! Cheers!!!! !